The shape and winding quality of an industrial coil are essential to the product’s success in an application. ACE can help provide industrial coils of inimitable quality with our Model 4841 electro-pneumatic constant tension device. Part of the 4800 Series, this device is designed to provide continuous adjustable tension to various types of industrial coils. The device is designed to provide constant tension to wire and foil. It is a versatile machine, capable of handling single or multiple wires and foils. These include square, round, or rectangular wire, as well as light, medium, and heavy ferrous and non-ferrous foil. It is a flexible machine, allowing for constant, automatic, and adjustable tension. The following are the standard specifications of ACE electro pneumatic devices. 4841 26"W x 26"D x 49"H 4" 9" 300 lbs. 350 lbs. The device ensures that there is zero backlash during operation. Automatic winding with no wire crossovers. Automatic tapering provided to coils on one or both sides. It completely eliminates the manual coil pounding and forming process. The device can change the tension pitch as per the wire or foil dimensions. The memory of the electronic panel can store up to 200 programmed winding recipes. The panel also consists of electronic controls to set the wire pitch. The device can be provided with a complete manual or automatic operation. The construction of the device can consist of heavy duty materials. A wire guide arm can be added to enhance process efficiency. Insulation paper can be used in the tensioning process for ferrous and non-ferrous foils. 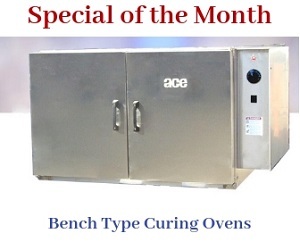 Depending on the client’s requirement and application, ACE also provides ancillary equipment to enhance process efficiency, and ensure effective coil winding. The wires is connected to the device via the wire guide rollers. The tension housing comprises the tension plates, as well as other mechanical components. During the winding process, the pneumatic actuator helps apply downward pressure on the tension plates. The tension sensor utilizes a load cell to convert wire tension into an electrical signal. This allows precise measurement of the wire tensioning process. Once the winding process has been completed, the manual valve is used to relieve the pressure on the tension plates. The coils can then be removed from the device.